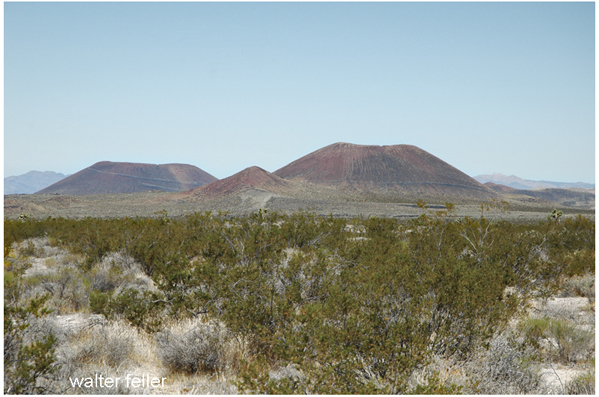 The skyline of Cima Dome is interrupted by the conical outlines of dozens of remarkably well-preserved volcanic cinder cones and black basalt lava flows. 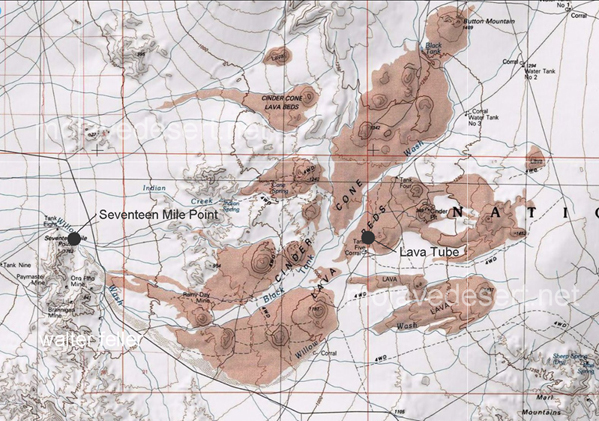 The earliest began about 7.6 million years ago and eruptions continued until at least 10,000 years ago, near the end of the most recent ice age. 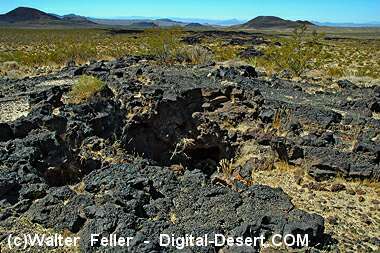 Unlike the violently explosive eruptions that created the rocks of Hole-in-the-wall, cinder cones form when lava erupts as relatively benign liquid fountains. As lava is spewed through the air, it solidifies instantly, often preserving bubbles created by escaping gasses. If an eruption of this type continues long enough, fragments accumulate to form a cinder cone. 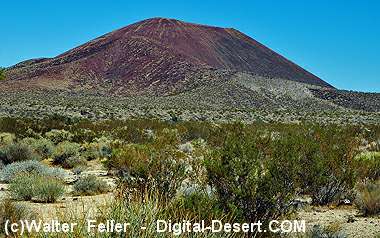 Cinder cones can develop very quickly. They typically end their lives with an outpouring of black basalt lava that flows across the landscape. Kelbaker Road passes through one of the youngest lava flows. See location on map below. 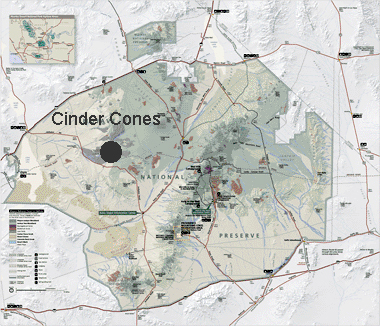 This map shows the locations of cinder cones and lava flows that make up Cinder Cones National Natural Landmark. You can see where Kelbaker Road crosses the toe of one of lava flows. This is a great spot to view basalt up close. The eruptions that produced this surreal landscape arrived late in the history of Basin and Range crustal stretching described at Hole in the Wall.